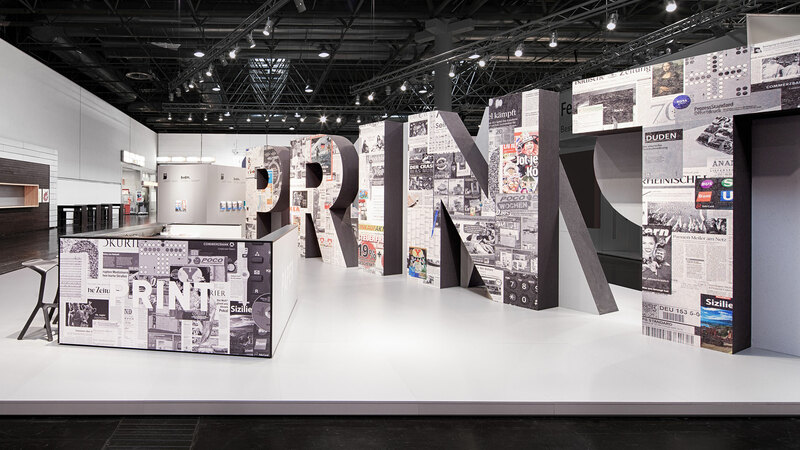 For the joint fair appearance of the German Pulp and Paper Association (VDP) and the Federal Association for Print and Media (bvdm) Dart arranges and implements an expressive fair architecture. 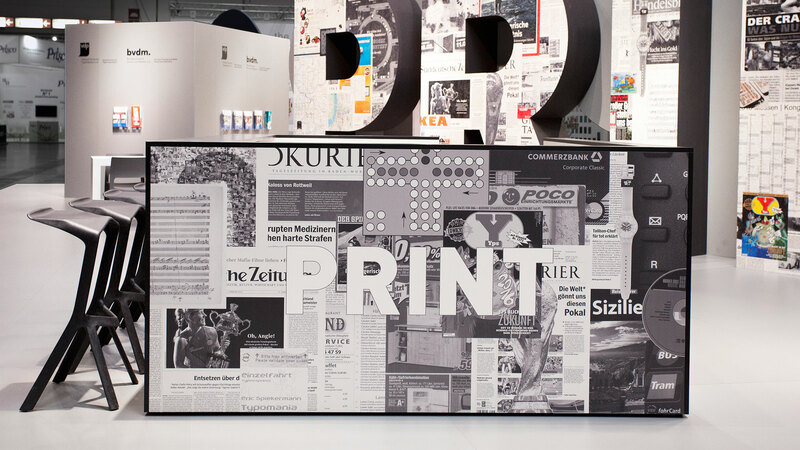 The associations present the fair’s core topics – print and paper – with oversized word sculptures. For the first time, VDP (Verband Deutscher Papierfabriken) and bvdm (Bundesverband Druck und Medien) present themselves with a joint stand at the leading international fair for print and cross-media. 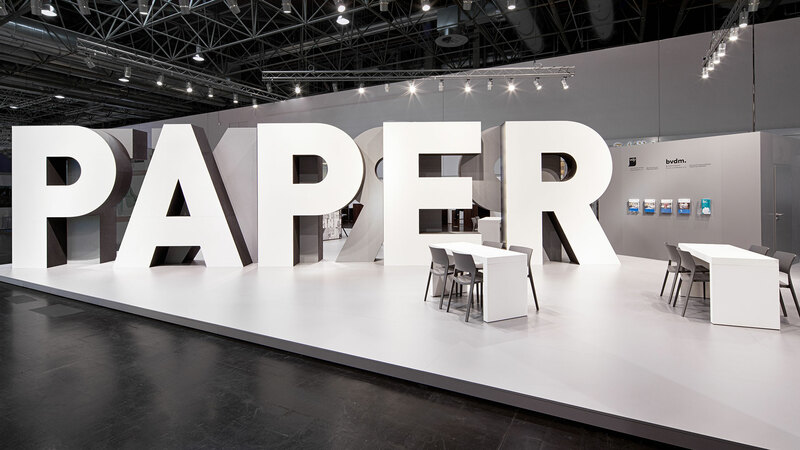 As a clear statement for a natural solidarity and collaboration of the two leading associations there are 3.50 metre high word sculptures “PAPER” and “PRINT” back-to-back in the centre of the exhibition area. The architecture takes this collaboration design-wise into account by placing the word sculptures as an architectonic key element into the centre of the 180 square metres large stand. They divide the space diagonally and thus create a stage for both associations on respectively one side of the stand, whereas the two protagonists share the information desk. 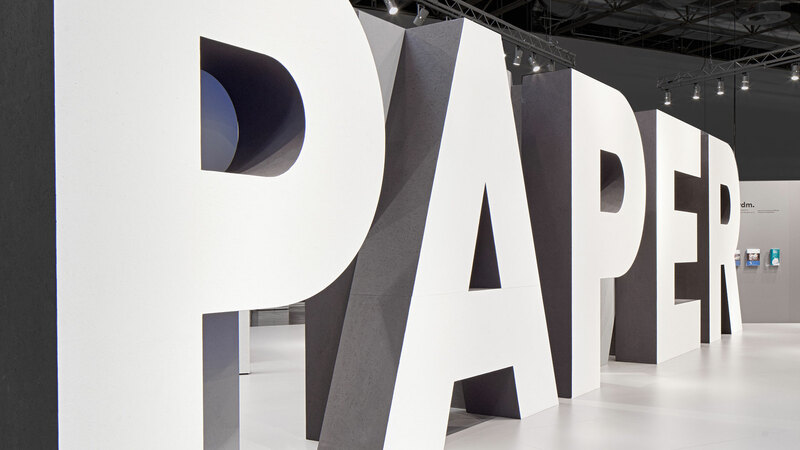 The word sculpture “PAPER” is wrapped in white paper and constitutes the design frame for the presentation of VDP, its counterpart “PRINT”, which is printed with a collage and depicts almost all the print techniques, arranges the setting for the bvdm. Our objective was to directly convey the message of significance and symbiosis of paper and print by means of the stand architecture. From our long-standing cooperation Dart knows everything about the essence of paper and has perfectly implemented the joint proposal of VDP and bvdm.